Matthew Ames was 39 years old when what started as a sore throat resulted in the loss of all four of his limbs. He had contracted streptococcal resulting in toxic shock and was never expected to survive. Now a year later Matthew has beaten the odds, spurred on by the fact that he is the father of four young children aged between two and nine and husband of a very dedicated wife determined to grow old with him. Since his limbs were removed, Matthew has been faced with incredible challenges. Some of the biggest have been in knowledge available to him about his prospects and ideas about how much he should expect to be able to do. 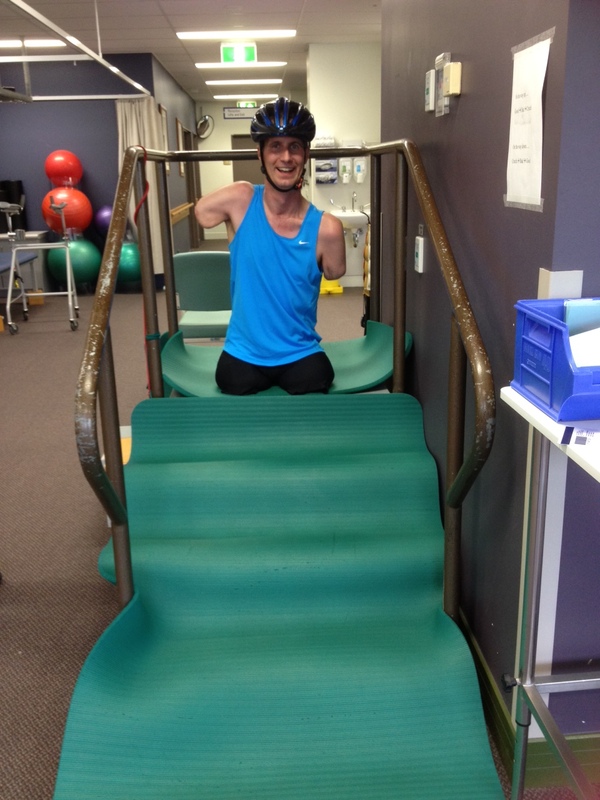 He is one of very few quadruple amputees in Australia, let alone globally. His limbs are significantly shorter than most and at present he relies entirely on his core strength to sit upright and move. Most prosthetics are designed in the context that other limbs are available (arm prosthetics, for example, that have levers that need another arm to manoeuvre). Matthew has developed his own ideas about what he needs, and the simple tasks of being able to walk unassisted and feed himself are at the top of the list. To be able to do this, he needs prosthetics that will cost around $500,000 per set. They will need replacing every 5 – 7 years. Matthew’s amputations were not acquired as a workplace or car accident, and he is too young to receive assistance as someone over 65, so the acquisition of these limbs and associated support is largely unfunded. Matthew came home in the first half of 2013, and is a continuing outpatient at the Mater Private Rehabilitation Centre in Brisbane. He has been focusing on his rehabilitation, and has started to share his story of resilience with others. He has also been communicating with government about disability services on behalf of those like him who fall through the funding cracks, and to raise awareness of issues in support for amputees. Matthew is currently undergoing a series of surgeries associated with a procedure called osseointegration. He will be the first quadruple amputee to have this done on all four limbs. Our aim, in September 2013, is to have Matthew up and walking by early 2014. This blog tells the story of Matthew and his journey.